The control panel is in the top left corner of the screen. Zoom the map in and out (plus and minus buttons). a combination of the above (Monroe WA). Select the map type from the pull-down menu. Access the "Help" and "About" pages. For zooming, you can also use the scrollwheel of your mouse or, in case of iPhone and iPod, pinch-to-zoom gestures. 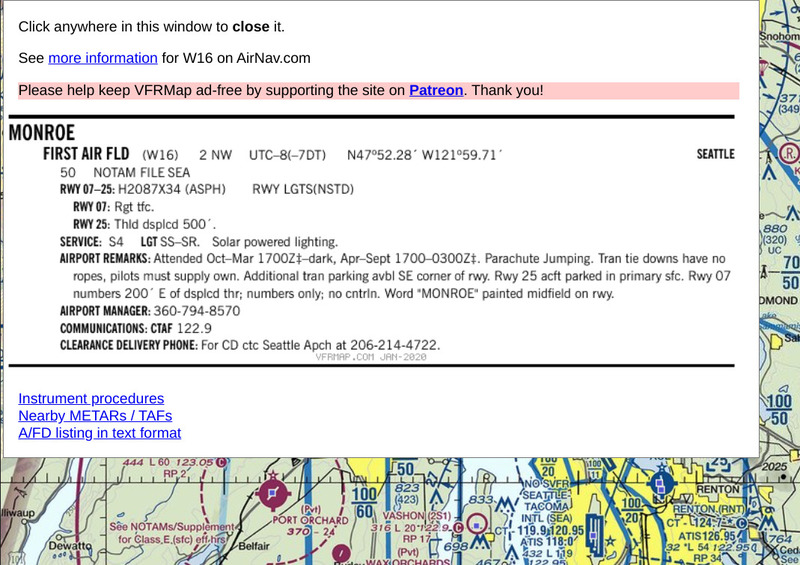 There are five types of FAA charts in the pull-down menu. 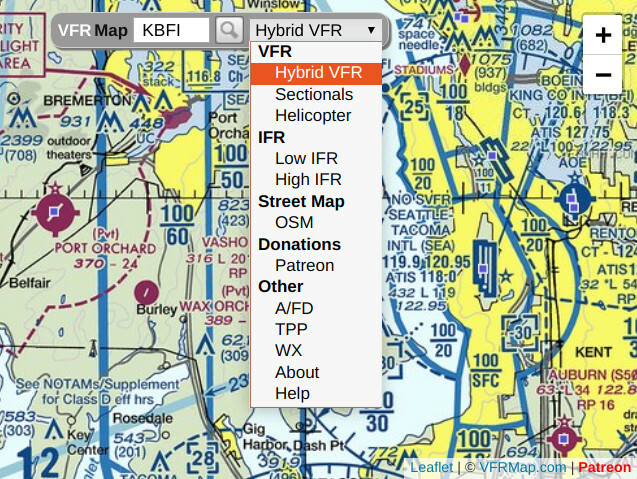 Hybrid VFR is a combination of World Aeronautical Charts (WAC), Sectional Raster Charts, and VFR Terminal Area Raster Charts, with more detailed charts shown at higher zoom levels. Sectionals and World Raster Charts can also be viewed separately, using the second and third options of the pull-down menu. The Low IFR type combines IFR Enroute Low Altitude Charts with IFR Area Charts. Finally, there are IFR Enroute High Altitude Charts (High IFR). When you zoom in too far, you may see blank tiles with a small gray cross in the middle. These tiles identify areas for which no data is available at the current zoom level. Click or tap anywhere on the listing to close it. The Airport / Facility Directory can also be accessed using this interface: http://afdsearch.com.